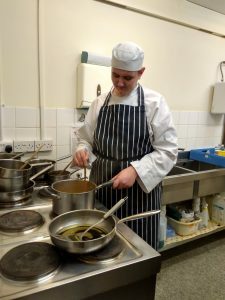 Michael has now been at Carmar Tea Room for six months and is making excellent progress. His manager, owner of the business and Head Chef, Mark, said that Michael has a natural talent. He is able to cook liver and bacon, a Carmar Tea Room speciality dish on his own. This involves dry frying the liver and knowing exactly when to take the liver off the heat and exactly when to add water to prevent it drying out. This is something that is difficult to learn and Michael has shown that he has a natural ability for this. He also has a delicate touch which is needed for making biscuits. Mark says that Michael has a great sense of humour and joins in with the banter in the kitchen. He has developed a good rapport with the team. He reads the orders, sets up the ingredients and lets Mark know he has done this. He has shown that he can be relied upon to get on with orders with minimal supervision. Michaels targets for the next three months are to continue with developing his skills and focusing on ensuring continuity. 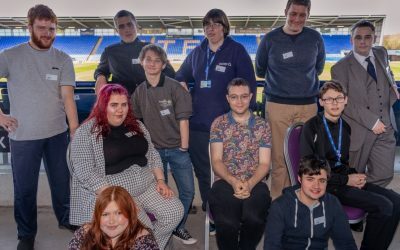 Michael also helped recently with making the Celebration Cakes for the Supported Internship Event at Shrewsbury Town Fooball Club, held by Enable. The cakes proved to be a great hit. 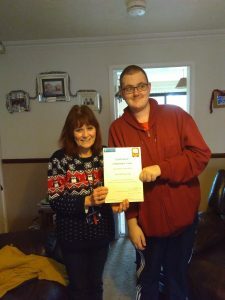 Michael also completed his Independent Travel Training through Enable in January 2019 where he received his certificate.